This week, for the first time in a decade, I ended up wandering up Connecticut Avenue just North of Dupont Circle in DC. I used to make this walk every day, from the Dupont Metro stop to my apartment, and I was amazed to see how little had changed. It was the same throngs of bright-eyed young people I remember, the same landmarks along the way, the same used record stores and coffee shops and bus stops. It made me aware of my age, but it was not at all unpleasant. 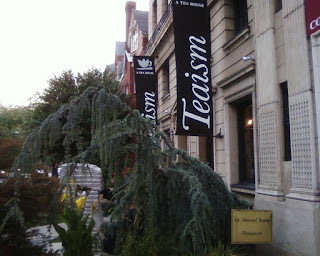 One of the landmarks I was thrilled to see was Teaism. Teasim opened up when I lived here, and it quickly became a little bit of a sanctuary for me. When I was feeling too riled up, too caffeinated, too sleep deprived, or, occasionally, too hung over, I walked the 4 blocks or so up S Street, ordered a pot of exotic tea and drank it slowly, watching the people on the street below from the second story window. Tea requires patience and presence, and Teasim the place seemed to pay respect to that. After a Sunday arrival close to 2AM, and a training starting early Monday morning, Monday night called out for Teaism, and there Teaism was. 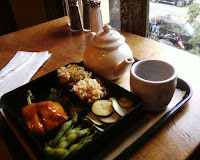 I had a Salmon Bento box. While beautifully presented and tasty, the food here doesn't call attention to itself: it is nourishing, simple and subtle. The tea, on the other hand is extraordinary. I had a small pot of Formosa Oolong that was rich and just a tiny bit smokey. The handmade ceramic cup was warm in my hands and the thin white wisp of steam from the teapot made little curls in the evening sunlight from the old window. I took deep breaths and ate slowly. I felt the myself get peaceful and quiet; felt the jitteriness melt into a simple desire to walk back down the worn wood stairs, to call home, and to take stock in the amazing run of luck I've had since I was last here.